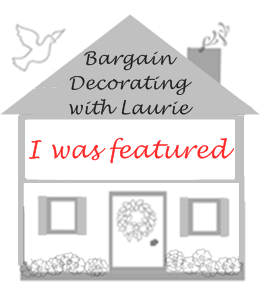 BARGAIN DECORATING WITH LAURIE: BUT CAN YOU FOX TROT? BUT CAN YOU FOX TROT? Yea! It's time for the Cloche Party hosted by Marty at A Stroll Through Life! Marty's cloche parties are always so much fun, and you won't want to miss seeing all of the decorated cloches in Blogville today. 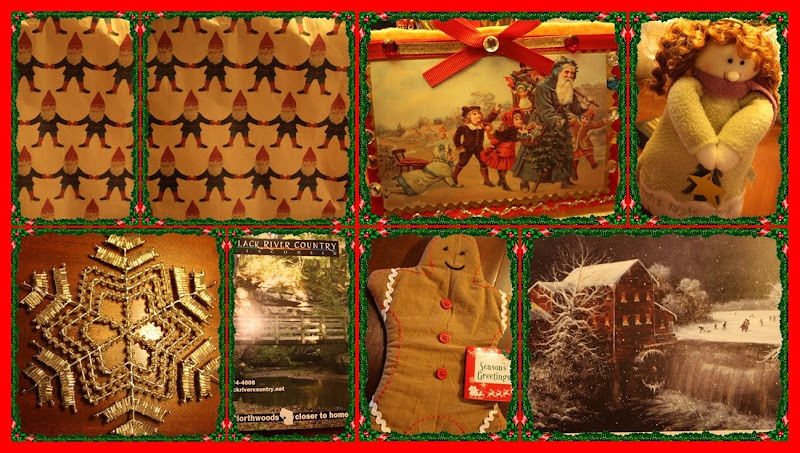 Christmas has come early to my house, because I have recently won some fabulous give-aways! Before you go running over to Applestone Cottage, I have yet another prize to show!! Lady Luck has really been shining on me lately! 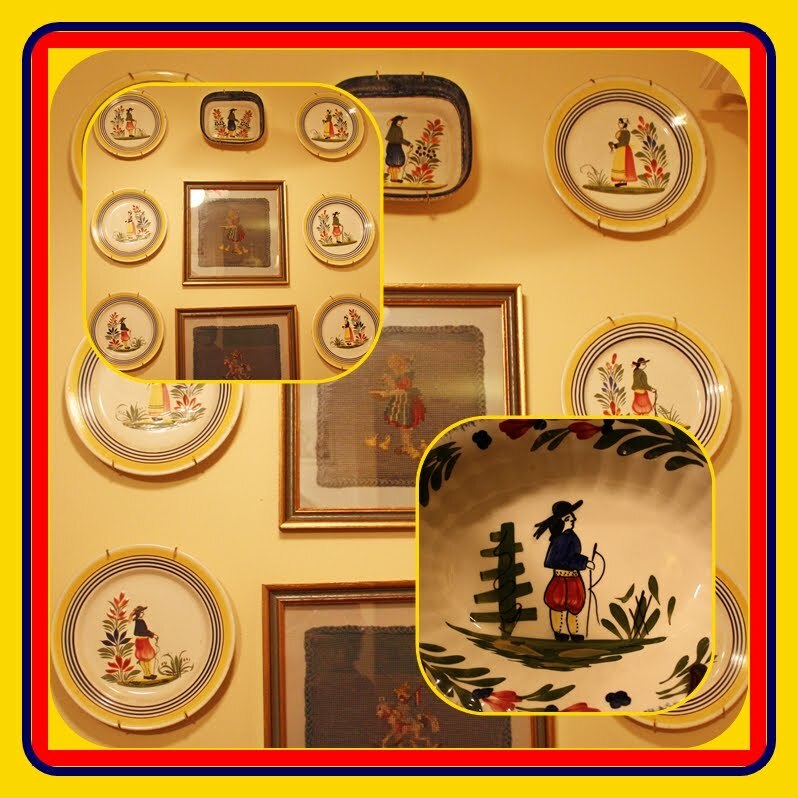 I have a small (make that very small) collection of Quimper plates. I used to call it a "small" collection until I found bloggers with huge collections. I love this pottery, so when I spotted a blog title that was "Quimper International Club", I had to go visit! 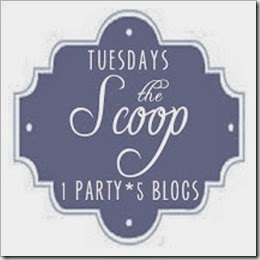 I have learned so much and seen such beauty on this blog. (I probably shouldn't admit it, but the only kind of Quimper I had ever seen was the kind with the Breton people on it!) Let me tell you, there is a LOT more Quimper than that, and it is all beautiful, and a beautiful group of ladies share the postings on this blog. 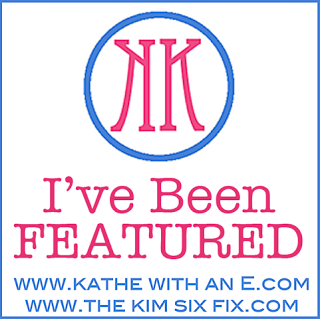 This is another blog you definitely will want to go see. You can just imagine how excited I was when I won the Quimper calender tea towel, which came all of the way from France! In addition to loving Quimper, my kitchen is blue and white, so a 2010 calendar will be in my kitchen FOREVER! Oh! 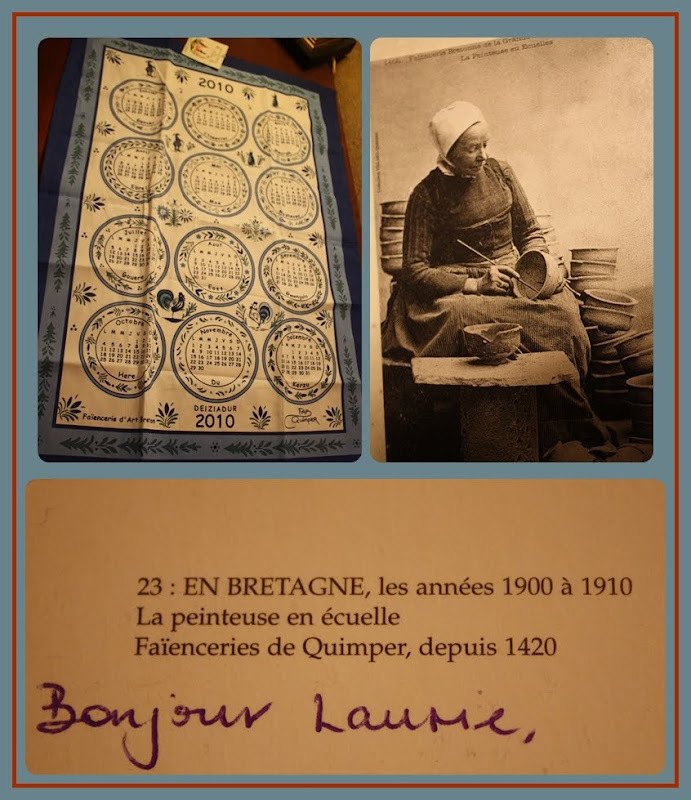 And look at the postcard of a French Quimper pottery painter. I just had to share the first line on the card with you. I have never received a card with the greeting "Bonjour Laurie"! How fun is that? Be sure to visit A Stroll Through Life to link to others joining the Cloche Party. I know there will be some fabulous cloches in Blogvile today! Reminder: I am still sending cards to Katherine and to Andrew. 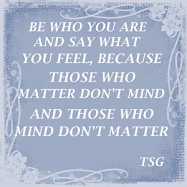 If you want to send a card, please see my sidebar. Thanks. 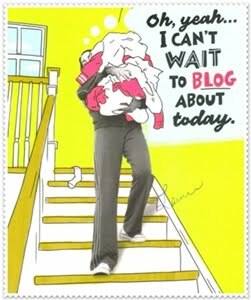 Laurie, I am still behind in catching up with all my favorite blogs and didn't know your father in law had passed away. I am so sorry- please accept my sincerest condolences. YOU have been quite the blessed lady too with wins!! Cindy is such a sweety it just fits her to give you such wonderful sweets! All your cloches are so pretty!! Congratulations on winning all the wonderful gifts. I don't know how you find time to do all that you do! Again, sorry to hear about your FIL. I knew something had to be wrong..I am so sorry. Please accept my deepest sympathy and know I will be praying for your family. I hope you have many good memories, they can never be taken away.. I don't know Quimper from a Wimper..but yours is lovely.Congrats on the towel..it is so pretty..Come over , having a give away too for my blogaversary. You are on a lucky streak! No, I can NOT foxtrot! thank you very much!!!!!!!! Love your Cloche's!!!! "so you think you can dance" to clever and way to cute! I'm sad to hear about your father-in-law. My thoughts and prayers are with you and your family during this loss. Your tribute is touching. Your cloches are too cute! Can't fox trot, but that one is my favorite. Take care sweet friend. Glad you one the Quimper give away! I love all of your Christmas cloches. My favorite is the fox family. I cracked up when I saw it. I have the very same fox couple in a cloche!!! Do you think we were separated at birth??? What are the odds. Oh Laurie, I am so sorry about your father in law! Congrats on your wins. I've never heard of Quimper until I started blogging. Still don't know alot about it. Your cloches are nice, but that nativity in the top picture is AWE*SOME! Congratulations on your win, and condolences on the loss of your father-in-law. I like your cloches, but I love that header! Wow! Laurie, so much in one post I'm trying to decide what to say first. I'm sorry about your father in law! I may have missed that along the line but still I'm sending hugs your way. Your cloches are beautiful. You are such a great decorator. Your home always looks pretty and inviting. I'm so glad you won -- those little lovies are going to a good home. I had never heard of Quimper pottery until I started blogging (hanging head in shame)! You have a lovely collection. And those foxes are just the cutest dancing couple ever! Please know that your family will be in my thoughts and prayers for the holidays ahead - it's always an especially sad time to lose a loved one. Laurie - you have been a lucky lady! I love all your displays! The foxes are just so cute and that cloche with the painting on the outside is just gorgeous! 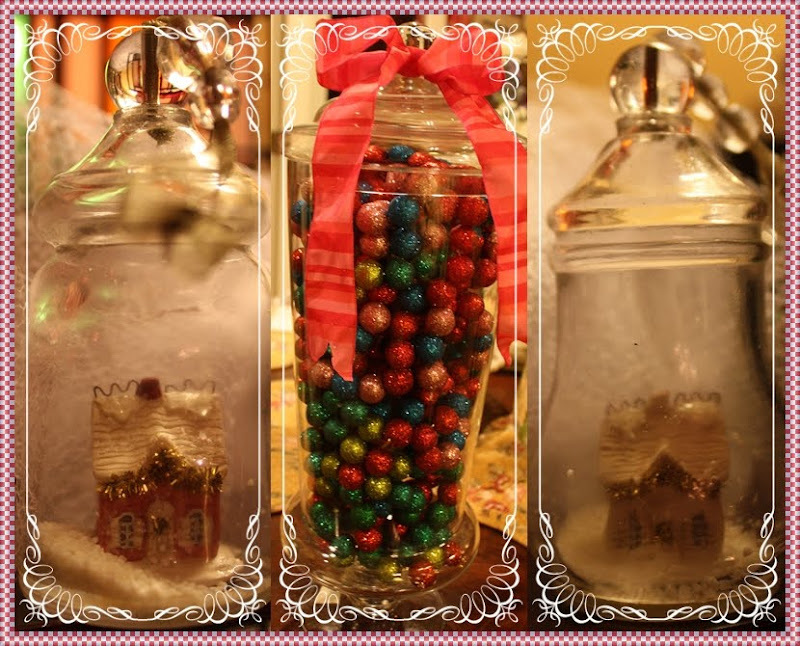 The tall jar with all the small balls reminds me of candy! Everything is just beautiful! Laurie: I am so sorry for the loss of your father-in-law. I will keep you in my prayers. You got some GREAT wins!! Lucky girl!! And I LOVE the cloches!! Especially the one with the foxes!!! Yes, I think I can fox trot. I so love that one. It is my very favorite and the detail on this figurines is just exquisite. Thank you Laurie for sharing them with me today. I love your goodies from Cindy. Yes she is a doll. I had the pleasure of meeting her in October. When she said she was coming to town, we set up a luncheon here in Arizona so we could all meet with her. It was a blast. Thanks again for sharing. 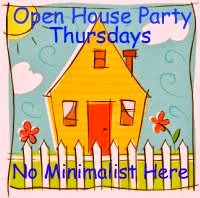 Please stop by and let me share my choches with you. All your cloches are beautiful but I'm in love with the hand-painted one! WOW! What a wonderful piece! So sorry to hear about your father-in-law. Oh, Laurie! I'm so sorry to hear about your father in law! My prayers go out to your family! Your clochieness is so lovely! Everything you do is! Love your new Christmas header! What a beautiful nativity! I am so sorry to hear about your father in law, Laurie. Christmas is arriving at our house. Doing things a tad different this year. I love your cloches! 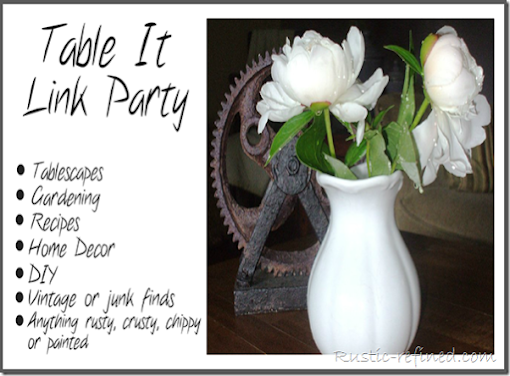 I did a few for the party,but I still need to get my Ralphie cloche put together, on the kitchen island. Great cloches!! I always love your mosaics. And I did notice that we have the same little school house. Sorry to hear about your father in law. 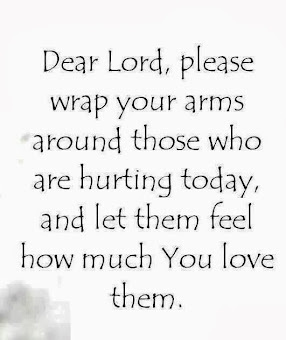 I will keep your family in my prayers. Thanks for visiting my post & leaving me a comment. I really appreciate it. 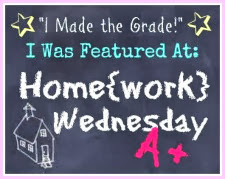 Hi Laurie, I'm trying to catch up with some of my long over due visits.Your blog is so beautiful to read and look at. Great tribute to your Father in Law,sorry to hear of your loss. I'll be back soon. Laurie, I love your cloche's. I'll have to admit that I've never done one, but I think they are so cool. Susie told me about your father-in-law's death. I was so sorry to hear the sad news. I know you will miss him. Your cloches are looking gorgeous! You have so many great ideas here. I'm so sorry to read about your father in law's passing. My prayers are with you sweet friend. Laurie, Your cloches are great. Especially the fox couple under glass doing the fox trot! So cute. 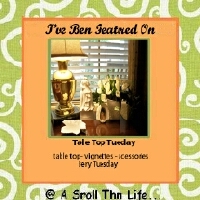 I am catching up on my favorite blogs and was sorry to hear that your father in law passed away. My prayers are with you and his family. Your cloches are just fabulous. You are so creative and everything you create is wonderful - it would be hard to pick a favorite. You have some gorgeous cloches! The snowflake looks pretty in the photo, I'm sure it is dazzling in person. So sorry about your FIL - lovely mosaic in his honor..he would be pleased I'm sure. Please accept my condolences of the loss of your father in-law. No I don’t Fox Trot, but I would like to. My husband is a good sport and has agreed to take dance lessons with me! Perhaps in a few months I can answer yes I do. Wishing you well. Thank you and everyone that cheer up my days, with all the lovely gifts and cards. First, my sympathies on the loss of your father-in-law. 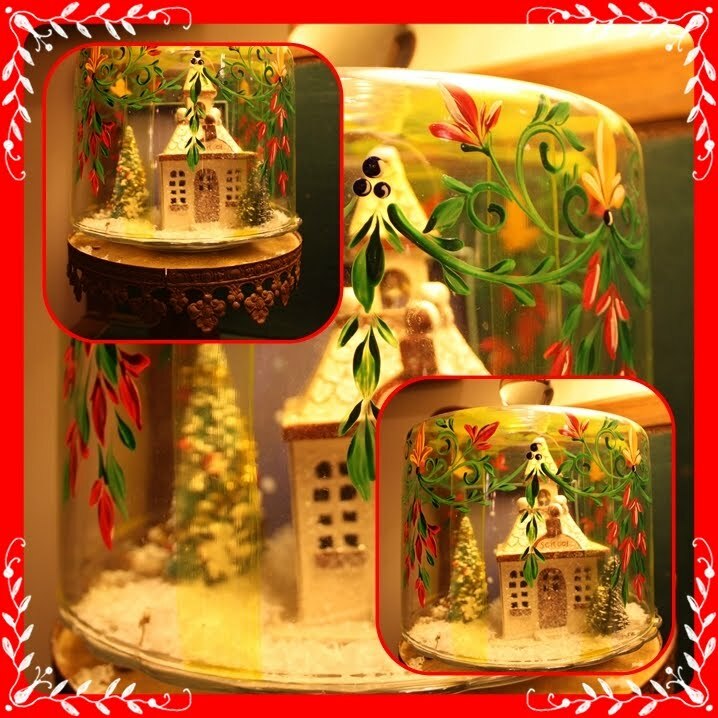 Such beautiful cloches, sweet little vignettes, wonderful gifts! My post was late getting up, but please do come by and visit me, too! As for your cloches, those darn foxes are so cute and funny! And that floral painted cloche is just amazing! Wherever did you find something like that? I had a client that introduced me to Quimper. She, too, had the Breton folk. I started looking on E-Bay for plates and discovered the other patterns. However, my favorite is still the Breton people. Glad you won the tea calendar for your kitchen. Enjoy! 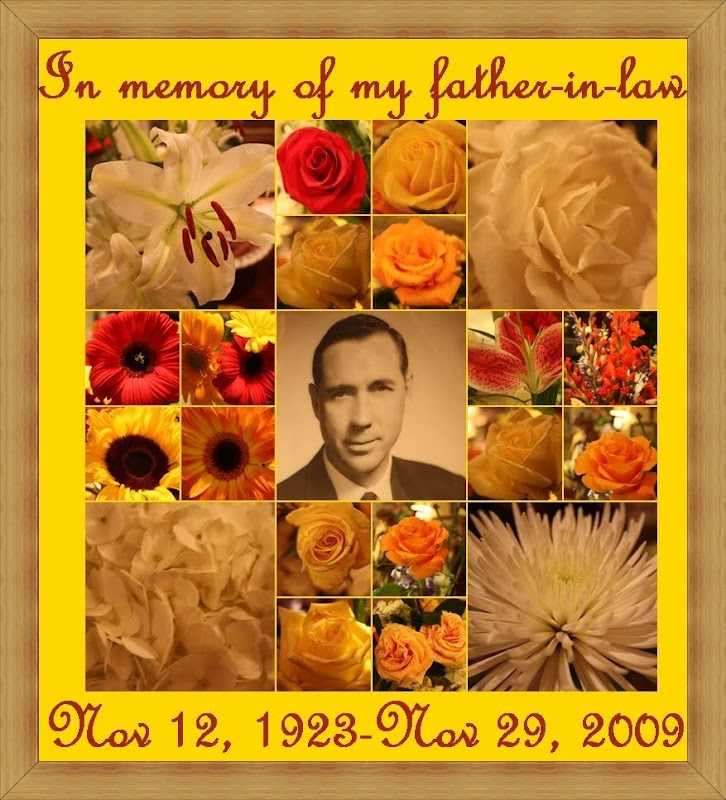 My deepest sympathy in the loss of your father-in-law. I do love your quimper collection! I'm not sure who made our fox couple. Mine came from a permanent vendor @America's Mart in Atlanta. Ditz...Midwest???? I just can't remember and the tags are off. Your cloches and your photos are just fabulous! I always look forward to stopping by to see what you are up too! Hugs! is especially sad when it happens around a holiday. Please know I will be thinking of you and yours. I just wrote a comment, and I lost connections with the internet loosing it all. I am in the process of switching ISP's. Miss talking to you all, but I will return to view your lovely work and mosaics. Your two trees flanking the fireplace are stunning! Your Navtivity on the mantel is so special.I just love all your vintage ornaments and Santa's. Do you take pictures to remember where you put everything? You do have quite a large collection of everything. Christmas closet sounds like a dream. Again, I am just amazed! Welcome to the Buy French Pottery Store! Shop our exclusive collection of handcrafted items. Our popular garlic grater plate comes in 4 unique designs. Our catalog features handmade items from France as well as other regions of the world. 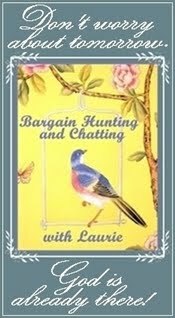 Hi Laurie - So sorry to red about your father in law. I shall pray for you all. Your snow picture is pretty -- enjoy it ! I have been out shoveling for the past 12 days and more is coming our way. I would enjoy winter more if the snow was warm ??? Miss everyone and the great posts ! I may come back maybe next year, you never know. I hope you all had a nice holiday. didn't it go by fast ?